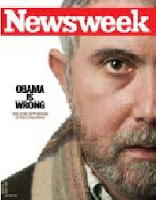 Newsweek Cover: "Obama Is Wrong"
Paul Krugman has emerged as President Barack Obama’s toughest liberal critic, writes Newsweek Editor-at-Large Evan Thomas in his profile of Krugman in the current issue. Krugman, a columnist for The New York Times, a professor at Princeton and a Nobel Prize winner in economics, was a scourge of the Bush administration, but has been critical, if not hostile, to the Obama White House, skeptical of the bank bailout and pessimistic about the economy. It was a clever liberal trick by Newsweek. Obama is wrong- but it’s not because he’s quadrupled the deficit. It’s because he’s too close to Wall Street. Oh brother. And, Newsweek wonders why it’s losing jobs and readers?